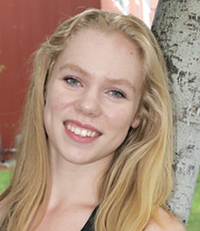 Sun Valley Figure Skating Club member Abby Chase became a U.S. Figure Skating double gold medalist on Sunday, Aug. 3 in Sun Valley. Chase earned her first gold medal in ice dancing last winter. She completed the Moves In the Field test series to attain double gold status during the club’s Aug. 3 test session. She also passed her second international dance, the Rhumba. She is coached locally by Lisa-Marie Allen, Brent Bommentre and Kim Navarro. A 14-year-old sophomore honors student at Bellingham High School in Washington, Chase attended Hemingway Elementary School in Ketchum for six years. She returns to Sun Valley every summer and Christmas to skate and enjoy the Wood River Valley, which she still considers home, according to a SVFSC press release. During the school year, Chase trains in Canada at the Vancouver Ice Dance Academy in Burnaby, British Columbia. The Academy is directed by 2006 Olympians and former Sun Valley Summer Ice Show skaters Megan Wing and Aaron Lowe. Becoming a U.S. Figure Skating gold medalist is the culmination of years of hard work and dedication to the sport. In a typical year, athletes complete approximately 40,000 U.S. Figure Skating test levels. Of those, about 1,300, or 3 percent, are passed at the gold or senior level, the press release stated. Sun Valley skaters Murphy Kendall, Jaysa Bozzuto and Valerie Ward also passed tests Aug. 3. Kendall passed the Hickory Hoedown and Swing Dance, completing the pre-Bronze dance level. Bozzuto passed Pre-Preliminary Moves in the Field, as well as the Canasta Tango and the Dutch Waltz ice dances, and Ward passed Pre-Preliminary Moves in The Field and the Dutch Waltz. Skaters who attended out-of-town competitions and test sessions this summer included Chase and Sheldon Gentling. Chase passed Junior Moves June 27 at Everett, Wash. Gentling placed second in Dramatic Entertainment and fourth in freeskate at and Preliminary level at the Centennial Park Skatefest Competition in Utah June 14.